Freemasonry is the U.K.’s largest secular, fraternal and charitable organisation. It teaches moral lessons and self-knowledge through participation in a progression of allegorical two-part plays. The Gilbert Inglefield Lodge was formed in 1965 and named after the then Provincial Grand Master of Bedfordshire and Lord Mayor of London, Sir Gilbert Inglefield who is pictured on the right. The Lodge is Number 8009 in the Register of the United Grand Lodge of England and meets at The Keep, Bedford Road, Kempston, Bedfordshire. 2015 was our 50th Anniversary year and we celebrated this event with a special meeting on 5th May. As this was our Anniversary meeting we had the full Provincial team in attendance to help us celebrate. The meeting consisted of a number of talks about the Patron and history of our Lodge followed by a special Festive board. We presented all attendees with a commemorative whisky glass and a booklet detailing the full history of the Lodge. 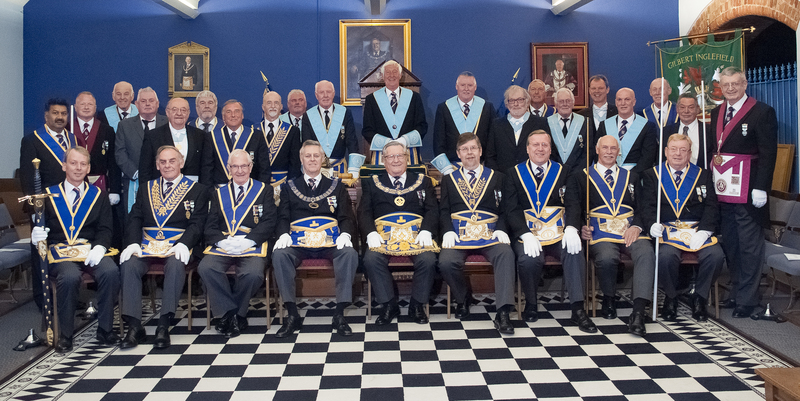 Of special significance was the attendance of a number of Brethren from our twinned Lodge in Bamberg Germany.